We probably should have done this earlier, but recently, we’ve begun the practice of praying short prayers aloud with the twins—during mealtimes and bedtimes, mostly, but it can also be in other times too, like when I prayed for their cough and cold to go away as I gave them an oil massage. I didn’t think much of it at first, but suddenly, I realized: it’s such a beautiful thing when you think about it. For them, praying to Jesus is much like playing with Him. Like when a parent and a child play together, praying to God pretty much achieves the same things. It is reveling in His presence. It is a communion of spirits. It is a method of learning and communicating. It is a sure-fire way of getting to know Him. It is a gift of time. Lord, may we always remember to seek You in prayer, and may You grant us the grace to raise prayerful children, children (and eventually adults) who are just happy to come to You and spend time with You, always. I had some cooked sago (tapioca pearls) left over from a rather dismal attempt at making mango sago dessert—which I only tried in the first place because I didn’t know what to do with the can of condensed milk that the maid mistakenly opened instead of evaporated milk. Anyway, I wasn’t in the mood to do any further recipe experiments with the leftover sago so it seemed much more fun to let the twins play with the slippery little beads. 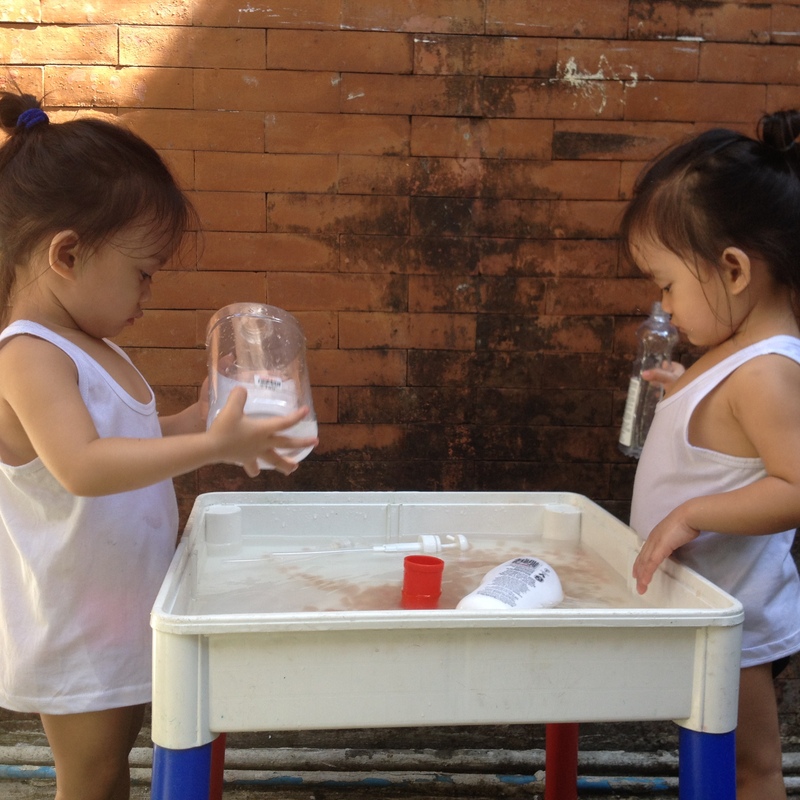 I just dumped the sago in the table where they usually do their water play, handed them a couple of empty bottles with small openings, and encouraged them to fish pearls out of the water and put them inside the bottles. That simple! Of course, it was rather too simple that soon enough they were ready to move on to other things. 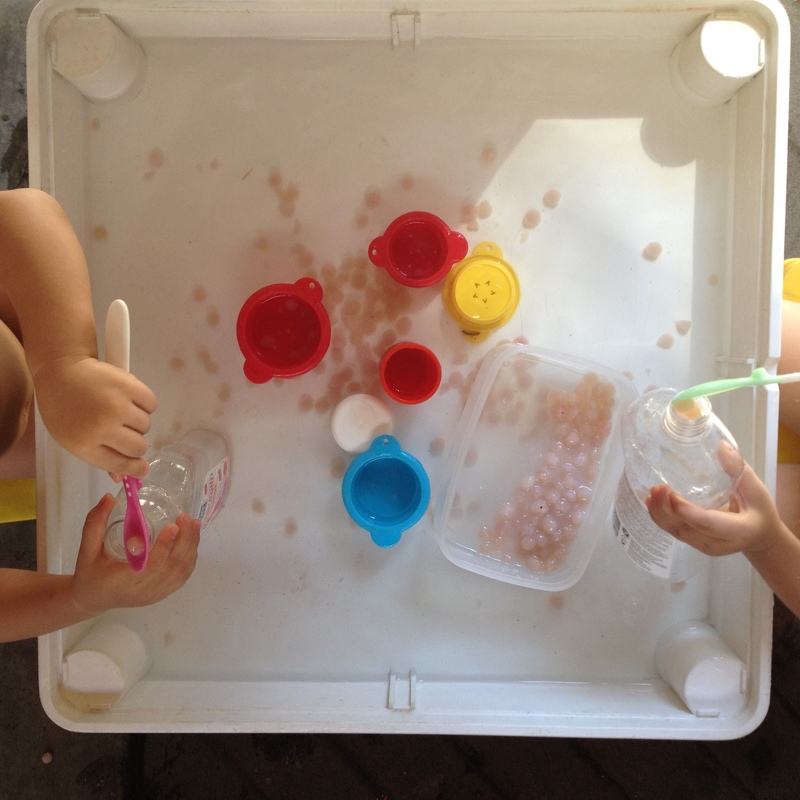 So after a while, in addition to the sago and bottles, the water table had also contained cups, sponges, AND their clothes to boot, which they wanted to wash. I stored the sago pearls in the fridge and brought them out to be played with again a couple of days after. To make things more challenging, this time I gave them spoons to use in scooping out pearls. This got them engaged a little longer, and also provided the opportunity for a bit of counting and problem solving: How many pearls have you got there? Only one? Can you scoop out two? Oh that’s a lot, can you shoot all that in the bottle? How many can go inside? They could only successfully scoop the pearls when they were getting them from the container, but once all the pearls were already submerged in the water, they couldn’t fish them out anymore using the spoon and went back to using their hands again. Would be interesting to see their skills develop; I wonder when they’d be adept enough to spoon things from under the water! 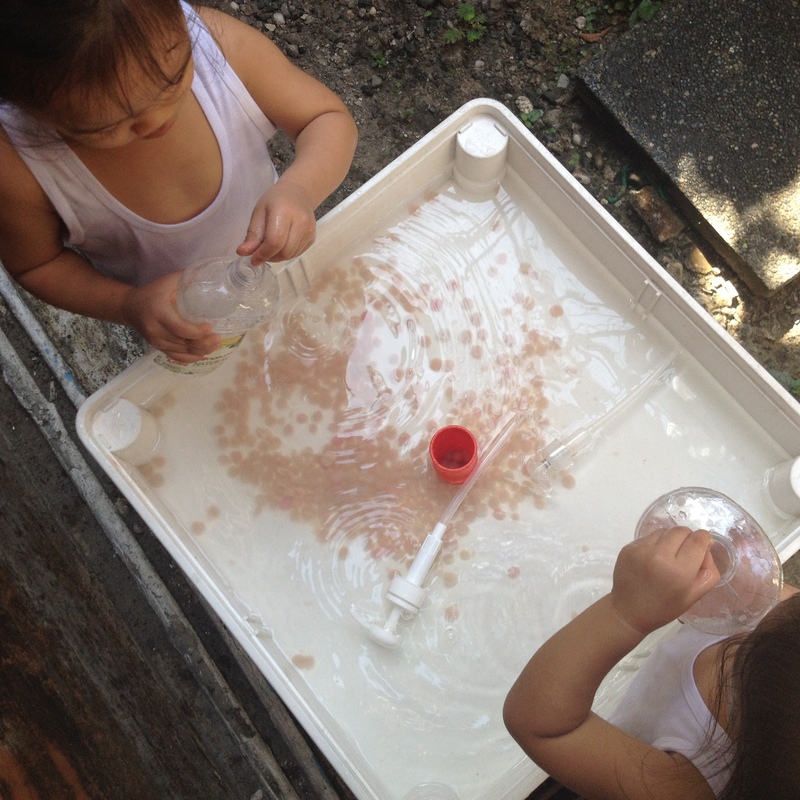 As always, the messy play becomes an easy transition to bath time, which we often do outdoors these days because of the crazy heat. Out come the hose, the tub, the batya. We toss a few cups in the water, the one with holes in the bottom, and let them scoop and pour and spill to their heart’s content. Afterwards, the twins like pointing out the wrinkled pads of their fingers: “Kulubot!” they’d say (or, you know, their mangled pronunciation of the word). Play, especially when self-directed, is not only natural — it is vital for our children’s emotional health. Through play babies naturally develop physical and cognitive skills, stretch their imaginations, flex creative muscles, build resiliency and a strong sense of self. 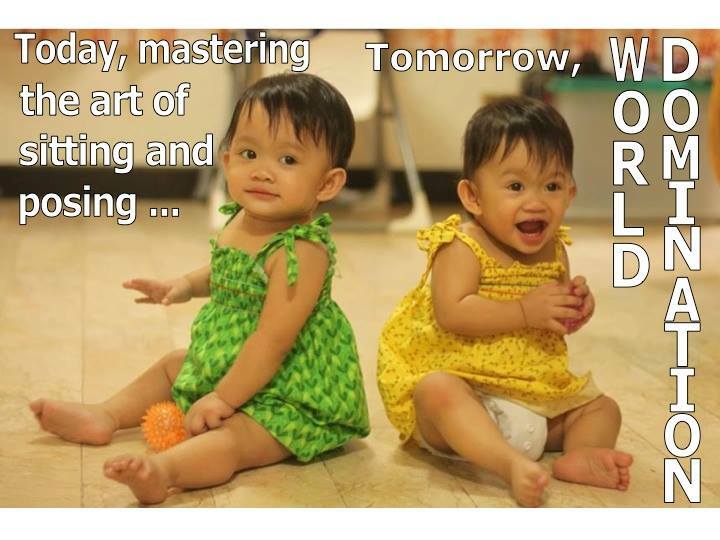 The quote above is from the article “Baby, You Are Born To Play” by Janet Lansbury, a proponent of RIE parenting. I can’t say I’m a full on RIE parent (actually I feel iffy attaching any label to my parenting, such as it is; I sort of do a little of this and a little of that style I guess), but a lot of the stuff I’ve read about RIE make sense to me. I’m not equipped enough to adequately describe what RIE parenting is all about (for that, you can check out this link), but letting kids enjoy uninterrupted, self-directed play is one of its principles. I used to feel guilty for not spending a lot of time doing “activities” with my twins, but now I can just say, hey, RIE parenting! Ok, just kidding. There is RIE parenting and there is distracted parenting, which goodness knows is also one of the things I can be guilty of. In any case, because they are now full-fledged toddlers, the twins have become increasingly adept at entertaining each other. As long as they know that I’m around, I can more or less just stay in one spot and let them do their own thing. Once in a while they’ll come up to me and sort of check in, tell me what they’re doing or ask for my help in something, then off they go again. They do pretend play, horse play, throw-everything-within-reach play, run-around-giggling play–whatever strikes their fancy. And should one twin happen to be asleep, the awake one is also capable of playing by herself. We’re still a long way to the point where I can actually work on my computer for long stretches while they play, but we’re also a long way off from when they needed to be entertained or held all the time. Mention the word “discipline” in the context of dealing with a child, and what usually comes to mind? Typically, one may have a mental image of a parent or teacher with a fierce look on his/her face, giving a stern lecture or command, with maybe a belt or wooden stick or some spanking implement in hand for good measure. Now, imagine that you’re a child: how does that sight make you feel? Scared, right? Or maybe even resentful or rebellious. Either way, it’s definitely not very encouraging. But that’s how discipline was traditionally done, right? And we turned out fine, right? Moooore or less fine—right? This is one of the most popular quotes on Positive Discipline, and it makes sense, doesn’t it? It’s always better when children behave because they actually want to—not because they were forced to. I was fortunate enough to get an opportunity to attend a workshop on positive discipline a few weeks ago, and it was such a thought-provoking experience. It was so refreshing to realize that yes, discipline does not have to be a painful experience for kids, that correction should not necessarily mean punishment, that you can say “no” and still be kind, and most importantly, that a lot of misbehavior can be prevented in the first place if you build the right environment for good behavior. In essence, positive discipline is anchored on building a loving, respectful relationship with your children, one that gives them a deep sense belonging and allows them to thrive and grow as capable, responsible individuals. This really struck me because lots of times, my two-year old twins act out because they’re simply craving for more attention from us—they feel the need for more attention and are discouraged that they’re not getting it. As I learned in the workshop, we are all social beings and we always need to feel a connection—children most especially. This connection is a basic foundation of positive discipline because, let’s face it, if your child doesn’t even like you very much, why would she/he obey you? I’m not saying that I’ve got it all figured out, of course. It’s a learning process, and we have to be in it for the long haul. 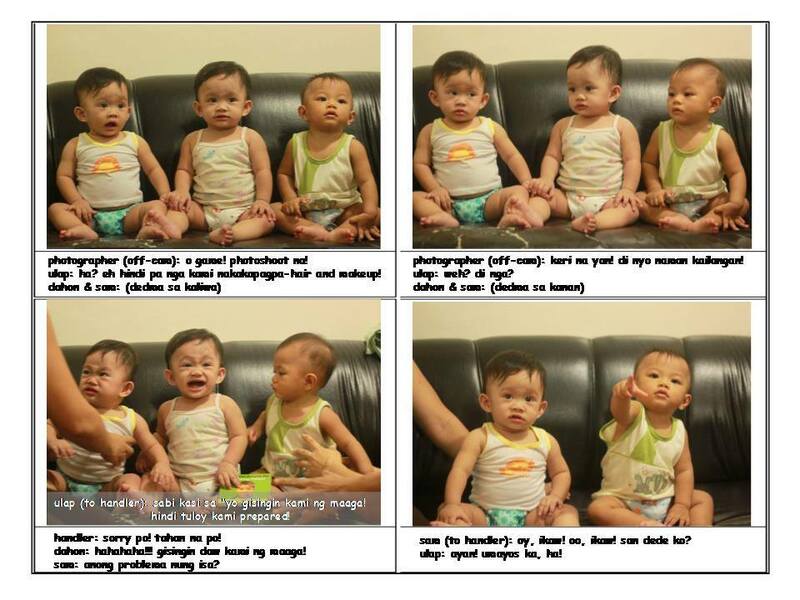 Right now, I’m still not confident of my grasp of what positive discipline is and how I should be applying it to my twins. Positive discipline is so much different—and harder!—from the usual “Just do as I say because I said so and do it now!” style that I find myself doing many times. In spite of my efforts, it feels like I’m still losing my patience with the twins lots of times, resulting in not so positive moments for all of us. I try to be patient, and positive, and sometimes, well, it doesn’t work. Except of course, sometimes, lots of times actually, it does work, and it’s beautiful. 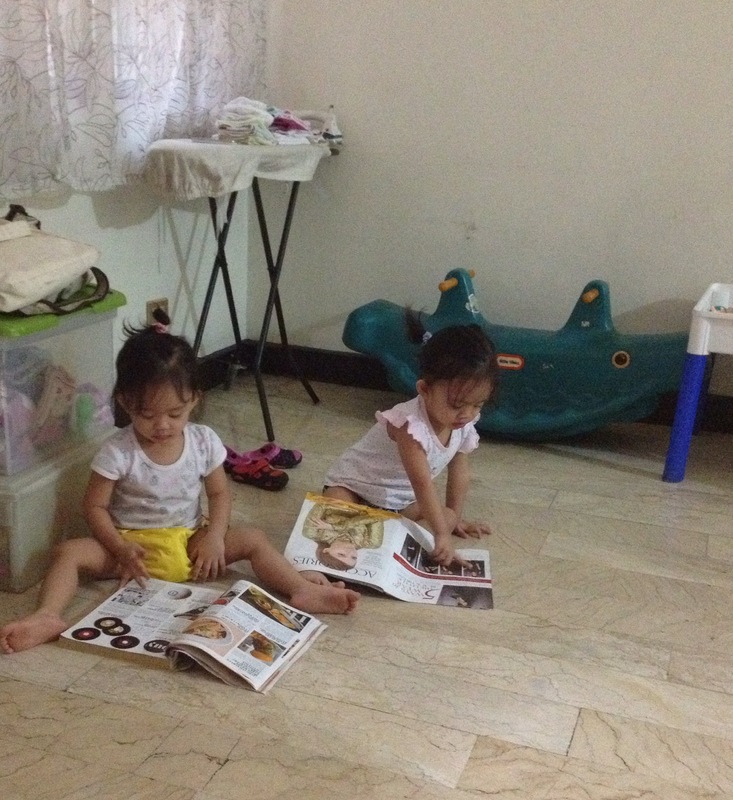 Time will likely come when they’d want costly toys or elaborate play sets or one particularly rare collectible, but for now, for a few minutes at a time anyway, they’re content leafing through old phone books and magazines. And I am amazed at the simplicity of their happiness, at their capacity to find joy – at the ray of sunshine streaking across the floor, at a piece of foam found lying around, at being thrown up in the air by Papa. With the right distraction, even the worst tantrums can vanish in the space of a moment, replaced by a smile and a suddenly lit up face. We’re only a couple of months in, but so far, really, the so-called terrible twos aren’t really terrible at all. We eat home-cooked meals most of the time because it’s more economical, not to mention it’s easier to adjust recipes or choose ingredients to make the food healthier or more attractive to our twin toddlers. However, I do admit that there are times—when things are hectic, or the fridge is almost empty and we can’t do groceries yet—it’s really nice to hark back to my single/pre-kid lifestyle and just order food delivery! In the olden times, i.e., my said single/pre-kid era, deciding to order food delivery means that someone will leaf through a bunch of fliers to consider restaurant and menu options. If you’re at home, the fliers will be stuck to the fridge or on a countertop somewhere. Of you’re in an office, the fliers will likely be in a somewhat frazzled and disorganized clear book. After aimlessly leafing through the clear book a couple of times or brainstorming for a few minutes with your companions, you will suddenly realize that you want to order from Restaurant X. You will then turn pages back and forth, and discover that the flier for Restaurant X is missing, whereupon you will complain very loudly to the whole office why that particular flier is missing. You will then spend the next ten to twenty minutes deciding again where to order, collecting everybody’s orders, and finally making the call—and consider yourself luck if your call gets you through a real person right away. So yeah, there were also some inconveniences to food delivery. Nowadays, though, you only have to be connected to the internet and things can go much faster. A lot of the major restaurants have their own website and online delivery services. But even better, there are services like Food Panda that gives you the opportunity to consider a wide range of restaurants and check out their menus. 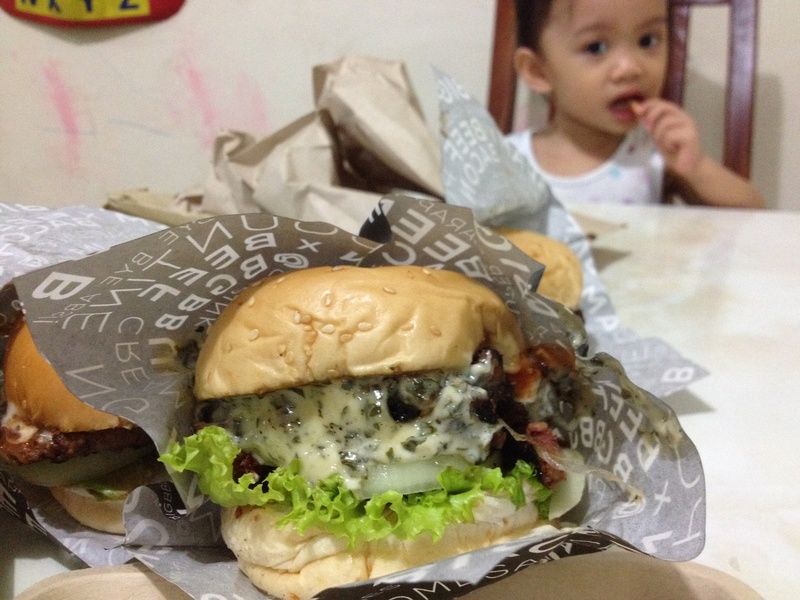 I haven’t tried this type of service before, but through the online community Mommy Bloggers Philippines, I recently had an opportunity to try out Food Panda. Using the website was quite easy. You simply input your location and the site will generate a list of restaurants that deliver to your area. A few clicks more will let you check out the menu of your chosen restaurant, select your order, select your payment option (credit card, paypal, or cash on delivery), and give your delivery address and contact info. A few minutes after placing your order, you will receive a phone call, SMS, or email confirming that your order is on the way.